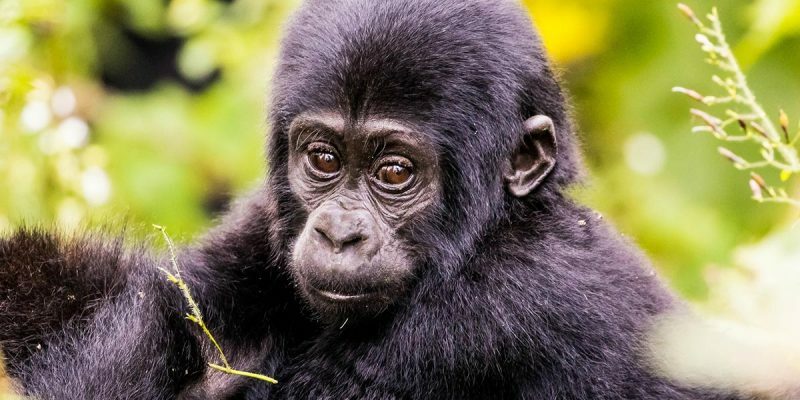 Set in the thick misty Virunga Mountains jungles, the 3 Days Bwindi Gorilla Trekking Safari is a jungle safari promising to change your whole experience of African Jungle Safari. Prepare to take a picturesque aerial flight from Entebbe to Kihihi airport in Bwindi Impenetrable Forest National Park where you’ll be guided into the jungle habitat of a selected gorilla family and once found, spend a full hour among the mountain gorilla family understanding how they eat, eat, communicate and feel. This experience in non-comparable to any other travel experience, so come with a camera or friend and share the experience. Pickup from your hotel at 6;00hrs and transfer to Entebbe airport for your flight to Bwindi Impenetrable Forest with Aero link Airline, that provides quality and safe flights within Uganda briefing on the safari from our staff, and transfer to Bwindi impenetrable Forest, southwestern Uganda for your Bwindi gorilla trekking safari adventure. The flight is a most comfortable flight of just one hour plus saving you 9 to 10 hours drive-time giving you added time in one of the most beautiful areas of Uganda. On arrival at Kihihi/ Kisoro airstrip you will be picked up by the staff of lodge you are staying at. You will be transferred in about 1 hour to the lodge. The anticipated bwindi gorilla trekking day – today you meet the gentle giants of the Virunga mountains. After breakfast, proceed for the morning briefing before enjoying the highlight of the trip- Gorilla trekking, which may last the entire day. We trek through the rainforest and bamboo covered slopes, accompanied by a guide and trackers, in search of a mountain gorilla family. The walking can sometimes be tough and long, but when you catch a glimpse of the magnificent silverback, any discomforts will be quickly forgotten. When sighted, visitors will be guided to within 6 metres from the gorillas, sit around them for a whole hour while gazing into their big round eyes. Bwindi Gorilla trekking is unpredictable. It’s difficult to foresee how many hours you will hike. The gorilla excursion can take from 2 up to 8 hours. Expect to walk along distance in steep and muddy conditions, sometimes with rain overhead, before you encounter any gorillas. A good physical condition is recommended. For conservation purposes, time spent with the gorillas is limited to one hour. A ranger will brief you on how to behave with the gorillas. While most of today’s forests are no more than 12,000 years old, Bwindi’s vegetation has been weaving itself into tangles over at least 25,000 years, in the process accumulating a lengthy species list. This includes 310 species of butterfly, 51 reptiles, 200 trees, 88 moths and an exceptional 120 types of mammal including 10 primates. The latter includes chimpanzee, L’Hoest’s, red tailed and blue monkey, black and white colobus, baboon, and Bwindi’s most famous resident, the mountain gorilla. Bwindi is a prime destination for birdwatchers. Its 350 species include seven which are IUCN red data listed and 90% of all Albertine rift endemics, species which are difficult or impossible to see in any other part of East Africa. Budget Tourist: Buhoma Community Campground (self-contained cottages). Early breakfast before embarking on our return to Kampala, your driver/guide will transfer you in time to the airfields either Kisoro or Kihihi to catch your flight back to Entebbe/Kampala. Up on arriving at Entebbe, you will meet us there to transfer you to Kampala or Entebbe. But if your flight back home is on that day we shall just come to welcome you back and see how your tracking went and other services. Please note that all international flights require 2 hours prior to departure.